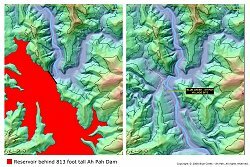 In the 1960s there was a plan to build a tall dam at Ah Pah on the Klamath River. 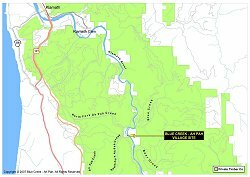 It would have covered the village site with 813 feet of water and would have created a lake extending over 100 miles upriver, drowning much of the Yurok, Karuk and Hupa territories. Increasing demands for fresh water, combined with decreasing supplies as a result of pollution and the effects of climate change, increase the potential for projects such as this in the future. Click on thumbnail for a larger image and to download a high resolution version of the map in Acrobat PDF format. 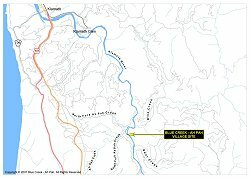 Map of the lower reach of the Klamath River as it flows through approximately 14 miles of Yurok Territory on its way to the Pacific Ocean. This map also indicates in a very graphic way, the large amount of aboriginal Yurok Territory that is now owned by private timber companies. Click on thumbnail for a larger image and to download a high resolution version of the map in Acrobat PDF format. Map of aboriginal Yurok Territory with current ownersip by various federal agencies and private timber companies. Shows all of Yurok Territory from Weitchpec to the Pacific Ocean at Requa. Click on thumbnail for a larger image and to download a high resolution version of the map in Acrobat PDF format. Map of the lower reach of the Klamath River as it flows through approximately 14 miles of Yurok Territory on its way to the Pacific Ocean. Click on thumbnail for a larger image and to download a high resolution version of the map in Acrobat PDF format. The latter map of aboriginal Yurok territory is part of a set of GIS (Geographic Information System) layers that you may download to construct your own maps. If you are new to GIS, go to Learn2Map.com for a free tutorial. The lines on the above maps are used strictly for informational purposes, and cannot and should not be used to prove right to ownership of the parcels of land so delineated. For example, the boundaries noted on the map of aboriginal Yurok territory are all either arbitrarily drawn by anthropologists/ethnologists, or are the results of government-approved surveys that have subsequently been entered into official county land records. The anthropological lines only roughly approximate areas that Yurok-speaking peoples once either inhabited or visited and used on a regular basis. They are the result of first-person interviews with Yurok individuals in the early Twentieth Century as well as often unreliable information gleaned from non-Indian interlopers or surrounding tribal groups. 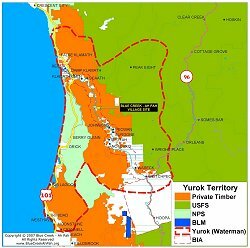 This map, then, shows the approximate areas Yurok peoples lived in or utilized on a regular basis before the coming of Europeans or Americans, and shows areas Yuroks are forbidden from living or utilizing today, due to federal and state laws, as well as corporate and private control of lands.